South of Banff Nationalpark and Assiniboine Provincial Park sits another jewel in the crown of the Canadian Rockies, 17,245 hectare Elk Lakes Provincial Park. The scenery of Elk Lakes Provincial Park, with its shear cliffs, waterfalls, and glistening lakes is breathtaking, yet the area is also easily accessible and contains hiker-friendly subalpine terrain with its attendant meadows and open forests. Beneath craggy ledges, remnant glaciers and icefalls, visitors can sit on the lakeside in quiet anticipation of seeing bighorn sheep or mountain goats, or get up early and catch glimpses of moose grazing in the meadows. The mountains in the area are named for French leaders of the First World War: Petain, Joffre, Foch, Castelneaus. The snow and glacier melt from these peaks feed Upper Elk Lake, making the water frigid and thick with glacial rock flour. The bent limestone layers of Mount Aosta and Mount Fox have similar geology to some areas of the Swiss Alps, with water carving its way through the limestone in unseen torrents and producing waterspouts that erupt like faucets from the rock. Beneath the alpine, brilliant fields of fireweed, Indian paintbrush and blue violet cover the summertime meadows. 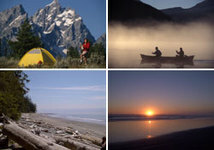 Activities include backcountry hiking of various difficulties; mountaineering; ice climbing; wilderness camping; wildlife viewing, and general nature appreciation. Some trails are suitable for family use and those with limited backcountry experience. Canoeing is available on lakes, with the nearest access point a 1 km walk, and 30m change in elevation, from the main parking lot. Backcountry, cross country and snowshoeing opportunities exist, but are limited by wintertime road conditions. Winter travelers should avoid the summer trail to Upper Elk Lake due to avalanche paths. Alternative access points for these activities are from the adjacent Peter Lougheed Park on the Alberta side of the park. Fishing for Dolly Varden, Rocky Mountain whitefish and Cutthroat trout are also possible in summer, and winter. Wildlife sightings may include black and grizzly bear, big horn sheep, mountain goats, marmots, moose, and a wide variety of birds, including spruce grouse, wrens, juncos, snipe, flickers or the Clark's nutcracker, as well as transient waterfowl. There are numerous options for camping, including the alpine club of Canada cabin at the trailhead. Camping is permitted in five separate areas. Lower Elk Lake has pit toilets, firepits, food caches, tent pads, as does Pétain Creek. Abruzzi Lake offers a pit toilet, metal fire ring and two tent pads. More basic Bivouac sites exist at Pétain Glacier and in the Cadorna Creek Watershed. Elk Lakes Provincial Park is located in southeastern BC, about 104 km north of Sparwood. Turn off Highway 3 at Sparwood and go north on Highway 43 till you reach the community of Elkford, a distance of 35 km. From here, travel the gravel road on the west side of the Elk River. Approximately 47 km north of Elkford the road crosses the Elk River and joins the Kananaskis Power Line Road. It is 5.8 km from the crossing to the Cadorna Creek trailhead; the Elk Lakes trailhead is a further 16.1 km.